Let's Check Out the Amenities That Come With the Ford Escape | Texstar Ford Lincoln Inc. If you are in search of a compact SUV, then the Ford Escape is an outstanding model. At Texstar Ford Lincoln Inc., we work diligently to keep our customers updated about our models. You can read further to learn about a few amenities that are offered with the Escape. The Escape comes with SiriusXM Satellite Radio, and you get navigation with SiriusXM Traffic with Travel Link. SiriusXM Satellite Radio provides you with over 150 music, live sports, news, comedy, and entertainment channels without commercials. SiriusXM Traffic with Travel Link uses the Global Positioning System (GPS) and 3D mapping for voice-guided directions, and you can also check the forecast, gas station locations, and fuel prices with this amenity. 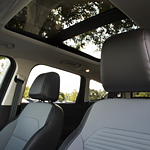 Another amenity that comes with the Escape is an available panoramic Vista Roof. This sunroof comes a forward panel that can be tilted or opened completely, and there is also a fixed rear skylight for your back seat passengers.